Bahama shutters can keep the heat and sunlight from entering your home or commercial property while also giving you privacy and hurricane protection. They are made of an extruded aluminum with a powdered coat finish that come in customizable colors. 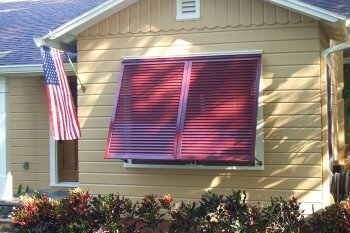 Sun Barrier Products offers three kinds of Bahama shutters. These include The St. Croix Full-View Bahama Shutter, The Martinique Bahama Shutter and The St. Lucia. Bahama Shutters by Sun Barrier Products, Inc. add a beautiful tropical look to your home or office while offering sun control, hurricane protection and privacy while allowing light and fresh air to enter your home, even when completely closed. Bahama Shutters keep the sun’s hot rays from ever hitting the glass in your windows, keeping the heat away from the interior of your home. Easy adjustment of the angle of the exterior shutters provide privacy. The St. Croix Full-View Bahama Shutter – Extruded aluminum articulating blades offer maximum visibility when open and hurricane protection when closed. This Bahama shutter is the only type that allows adjustment of the blades, in addition to adjustment of the frame. The Martinique Bahama Shutter – Fixed double-wall extruded aluminum blades offer visibility when open and hurricane protection when closed, with the option to close and lock from the interior. The St. Lucia – A decorative non-rated Bahama shutter that is available in 2” fixed angle extruded aluminum blades in a low-profile frame; providing you a lighter weight, lower cost shutter for architectural decoration and solar protection.